On December 1, the second- and third-year law students in Professor Catherine Stahl’s Trial Advocacy class welcomed Eric Lopez ’14 to present a lecture on the fundamentals of trial advocacy in administrative courts. Mr. Lopez is a staff attorney with the National Immigrant Justice Center’s Detention Project. Mr. Lopez highlighted the opportunities and challenges facing advocates in immigration court, providing many practical examples from his own busy docket. Mr. Lopez’s passion for his work was crystal clear as he explained, "Going into trial is the favorite part of my job. I am fighting like crazy for a result in which I believe very strongly." "Presentations such as Eric Lopez’s are a critical component of the Trial Advocacy Program supporting its principal goal of transforming law students into lawyers with the skills they need to excel in the legal profession," stated Professor Stahl, Director of the Trial Advocacy Program. "We extend many thanks to Mr. Lopez for meeting with the class," continued Professor Stahl. "His comments about the trajectory of his career from the College to the courtroom were very inspiring to the students. 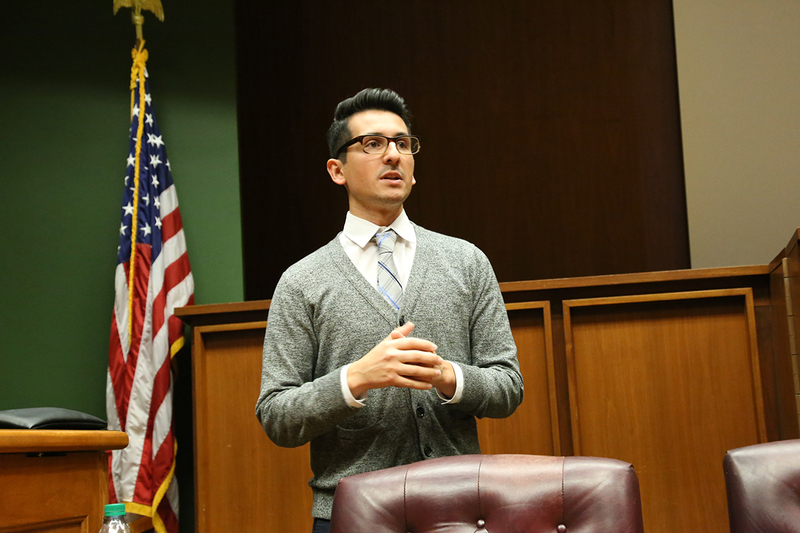 Lopez’s ardent presentation combined an abundance of useful tips and techniques, skillfully illustrated by his detailed first hand experiences as a trial advocate."